Gorgeous home in the new community of Strada in Orchard Hills! This fantastic home is located within a small cul-de-sac of 10 homes. The extra-long driveway accommodates 4 cars. Beautiful 5 bdrm/4 bath home has a light and bright interior with travertine floors, gourmet kitchen with warm, neutral-stained cabinetry, granite countertops and stainless-steel appliances. The kitchen has never been used. Owners do not and never have cooked in the home! 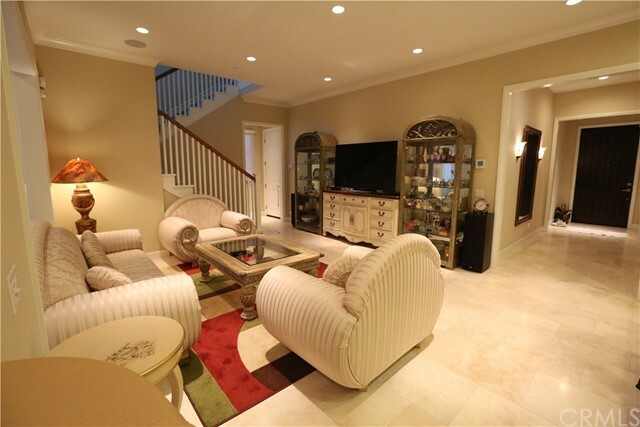 Spacious living room and open floor plan with Conservatory room. Owners have added a PERMITTED 515 sq ft ensuite bedroom with its own entrance. Perfect for in-laws, nanny, or live-in housekeeper. Additional bedroom downstairs adds to this home's versatility. Upstairs master bedroom suite and two more spacious bedrooms offer luxurious yet cozy living. All of this, plus award-winning Irvine school districts!